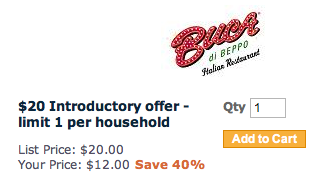 FREE Lasagna at Buca Di Beppo with purchase! 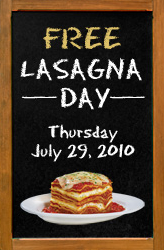 Buca Di Beppo is offering a FREE lunch sized portion of Lasagna on July 29th! To get it free you need to purchase any Buca Small or Buca Large Pasta or Entree. Add that to this City Deals Gift Certificate and you got a even greater deal!! Grab it now so you'll have it in time for the 29th!